Release Well-Being Center’s Mission is to promote holistic self-care. Our transformational programs, classes and experiences are designed to help you release the obstacles to well-being. Linda’s dream to open a holistic wellness center and spa began 16 years ago when she visited Canyon Ranch in Tucson. As a new mom with a demanding job she had a lot on her plate and felt exhausted, stressed and overwhelmed. She set a goal to learn how to embrace her busy life with joy and purpose. While in Tucson, she immersed herself in the many wellness offerings including exercise, meditation, nutrition counseling, tapping, positive mantras, cranial sacral therapy and more! This was truly a life-changing experience, and she felt amazing as she boarded the plane home. Linda brought these lessons back with her and changed her habits based on what she learned, resulting in a positive impact on all areas of her life. As she saw others in her family and community similarly white-knuckling their way through their lives, she wished she had a way to share this transformative experience. Linda is thrilled that her dream is now a reality with the opening of Release Well-Being Center —a state-of-the-art spa and holistic wellness center. We invite you to enjoy the transformational programs, classes, and experiences designed to help release what doesn’t serve you and optimize well-being! Our community of experts in a mindful and healthy living will integrate the many wellness offerings and guide you towards balance, purpose and a mindful, holistic lifestyle. Linda is proud and honored to announce that part of that dream will incorporate the Nathan Fisher House on Route 9 in Westborough. From the very first moment she walked through the house in May 2015, she knew that it was the perfect space for her wellness center. Since that day, she has submerged herself into the history of the house and its early neighbors. The Nathan Fisher House has been home to many different people and endeavors dating back to 1822. It has been a retail store, a farm, a school, and interestingly enough, even a wellness center that promoted hydropaths, Swedish movements, oxygenized air, light gymnastics, and Turkish and hot air baths for the treatment of chronic illnesses. Now the Nathan Fisher House, which had been unoccupied and slowly returning to nature for several decades, will come full circle. In December 2016, the doors of Release Well-Being Center will open, breathing new life into the building. Release will incorporate many of the previous lives of the house including a retail area, vegetable and herb garden, a place of knowledge sharing as well as many of the same wellness methodologies. This will be a natural progression for our community to enjoy. Our 11,000 square foot state-of-the-art facility consists of two buildings: the historic Nathan Fisher House and a new 7,000-square-foot wellness, Sanctuary. The Nathan Fisher House includes our administrative and coaching offices, an intimate yoga and wellness education studio, the Nourish Café and a boutique. 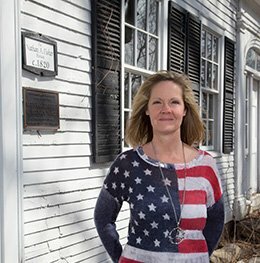 To honor the Nathan Fisher House’s history as a community landmark, we will also invite community groups to utilize the Nathan Fisher House studio for meetings, seminars and events, and allow local entrepreneurs and small business owners without a brick and mortar presence to reserve space in the boutique to to showcase their goods and services. Our new wellness building, Sanctuary, houses our 1500 square foot heated yoga studio (which can comfortably fit over 60 mats) a high-tech fitness studio, fully-stocked locker rooms, a luxurious spa, the Bliss heat therapy rooms, and another boutique. Release’s beautifully landscaped grounds include an outdoor yoga and fitness space, meditation garden, tranquility garden, and fire pit for outside events. We look forward to our team becoming a part of your team as we work together towards creating holistic, healthy and happy living! Join our mailing list to receive updates about offerings and promotions. And we’d love to hear form you with your questions and comments!